Jersey has no proven fossiliferous rocks. Only the superficial deposits, such as the loessic clays and silts have yielded any faunal remains. 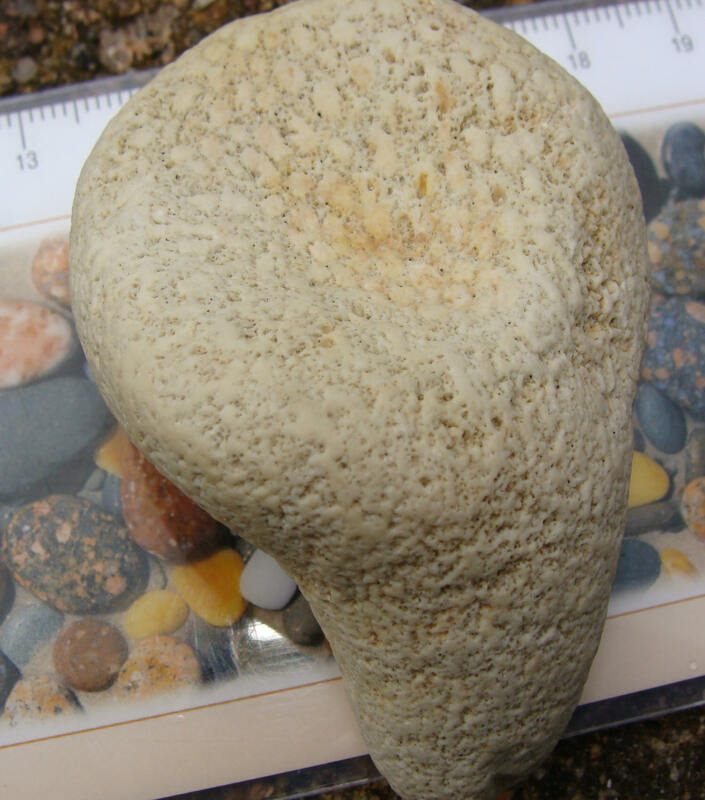 Recently, beach gravels along the south coast near La Grève d'Azette and on the north east coast near St. Catherine's breakwater have yielded the following two fossils from off-shore sources (see Home Page ...Stop Press). Help is needed in identifying them. They are silicified and superficially resemble an echinoid and a coral. However, the hexagonal symmetry of #1 and the absence of septa etc. in #2 indicate otherwise. A possible source area is the Mesozoic sea floor deposits north of Jersey. The Jersey Shale Formation hasn't yielded any fossils yet but patches of dark grey carbonaceous grains which may be remains of organic material are the only possible traces; trace fossils similar to Sabellarites (Squire, 1973) were later attributed to recent polychaetous annelids, possibly Polydora sp. (Bland et al., 1987). The overlying Jersey Volcanic Group has yielded no faunal or floral remains in the rare ephemeral, subaerial fluvial or lacustrine deposits of the St. Saviour's Andesite Formation. In the Rozel Conglomerate Formation, the only flora or fauna which could have survived would have been those which would have tolerated the ephemeral mud flats, occasionally subject to dessication. The rain drops, rill or ripple marks described by Mourant (1933) and also illustrated by Nichols & Hill (2004, p.80 - 81 ) were thought to be evidence of the trace fossil Arumberia (Bland, 1984). This and the occurrence of possible Leiospheres are discussed further under Conglomerates. In the superficial deposits, remains of roe or fallow deer (Cervus elaphus jerseyensis Zeuner), Quaternary molluscs, eg. Patella vulgata (Linné) and Astralium rugosum (Linné) along with seven other species have been found in the 8m raised beach in La Belle Hougue Cave (Zeuner, 1946, p.238; Baden-Powell, 1946, p.253). In other raised beach deposits, at La Cotte de St. Brelade there are mammoth remains, bones of Mammuthus primigenius (Blumenbach), and deer bones which were found along with bones, teeth and tools of Homo sapiens neanderthalis (King) (Bishop & Bisson, 1989, p. 89-90), while in the clays west of Seymour Tower a mammoth tooth of the same species has been found (Dr. A. E. Hill. pers. comm.). 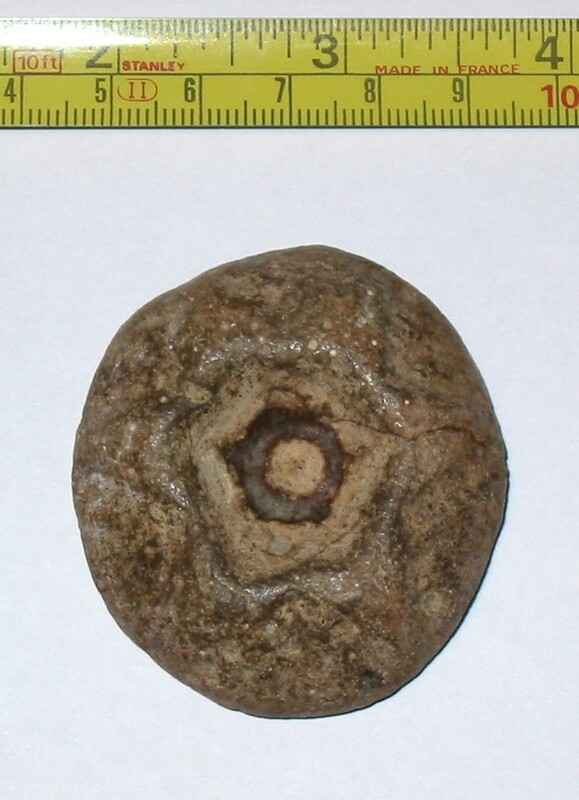 In the loess deposits of La Motte (Green Island), concretions contain a molluscan fauna of Pupilla muscoram (Linné), Oxyloma pfeifferi (Rossmässler) and Trichia hispida (Linné) (Davis, 1996, p. 8. unpubl.). In the peat beds, boreal forest pollen assemblages have been recorded and tree stumps of Birch (Betula) and Alder (Alnus) occur in the submerged forest between Le Port and L'Ouzière slipways in St. Ouën's Bay, while in the humus layers within the overlying aeolian sands there are the terrestrial gastropods, Cernuella virgata (da Costa), Cochlicella acuta (Müller) and Pupilla muscorum (Linné) (Bishop & Bisson, 1989. pp. 92 - 93). At Pontac, east of La Motte and Le Nez Point, bovine bones have been found in the loess. Baden-Powell, D. F. W. 1946. Report on the Mollusca from Belle Hougue Cave, Jersey. Bull. ann. Soc. Jersiaise, Vol. 14, Pt. 7, p. 253. Bishop, A. C. & Bisson, G. 1989. Classical areas of British Geology: Jersey: description of 1:25,000 Channel Islands Sheet 2. (London HMSO for British Geological Survey). Bland, B. H., Evans, G., Goldring, R., Mourant, A. E., Renouf, J. T, & Squire, A. D. 1987. Supposed Precambrian trace fossils from Jersey, Channel Islands. Geol. Mag. Vol. 124, p. 173. Davis, D. 1996. Important Geological Localities of the Island of Jersey. Possible sites of Special, or Special Scientific, Interest: A First Listing. Unpubl. Rpt. Environmental Services, States of Jersey. Squire, A. D. 1973. Discovery of late Precambrian trace fossils in Jersey, Channel Islands. Geol. Mag. Vol. 110, pp. 223 - 226. Zeuner, F. E. 1946. Cervus elaphus jerseyensis, and other Fauna in the 25 ft. Beach of Belle Hougue Cave, Jersey, C.I. Bull. ann. Soc. Jersiaise Vol. 14, Pt. 7, p. 238.